RJC said appointment of former Senator Chuck Hagel as Secretary of Defense would be a "slap in the face" to all pro-Israel Americans. The Republican Jewish Coalition (RJC) announced its opposition to the potential appointment of former Senator Chuck Hagel (R-NE) as Secretary of Defense, citing a long list of actions Hagel has taken that raise alarms about his failure to support Israel. 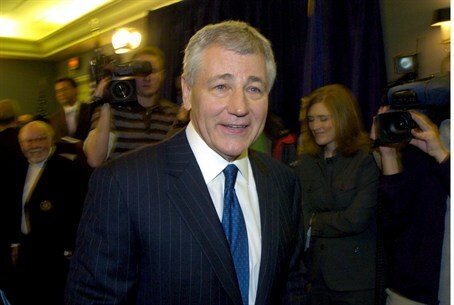 Hagel is said to be the leading contender to replace Defense Secretary Leon Panetta, who is expected to step down early next year. The RJC outlined a number of instances highlighting Hagel’s anti-Israel record: In August 2006, Hagel was one of only 12 Senators who refused to write the EU asking them to declare Hizbullah a terrorist organization; In October 2000, Hagel was one of only 4 Senators who refused to sign a Senate letter in support of Israel; November 2001, Hagel was one of only 11 Senators who refused to sign a letter urging President Bush to continue his policy of not meeting with Yasser Arafat until he took steps to end the violence against Israel; In December 2005, Hagel was one of only 27 Senators who refused to sign a letter to President Bush to pressure the Palestinian Authority to ban terrorist groups from participating in Palestinian legislative elections; June 2004, Hagel refused to sign a letter urging President Bush to emphasize Iran’s nuclear program at the G-8 summit. Hagel also said he didn’t think he had ever signed one of the letters the American Israel Public Affairs Committee (AIPAC) regularly circulates to demonstrate support for Israel or tough stands against its enemies such as Iran. “I didn’t sign the letter because it was a stupid letter,” he said in the interview with Miller, referring to one such memorandum. Hagel ignited further ire from the Jewish community when he dismissed criticism against his inadequate support of Israel. “I’m not an Israeli senator. I’m a United States senator,” he said during his interview with Miller. “I support Israel, but my first interest is I take an oath of office to the Constitution of the United States, not to a president, not to a party, not to Israel. If I go run for Senate in Israel, I’ll do that,” the senator said. “The appointment of Chuck Hagel would be a slap in the face for every American who is concerned about the safety of Israel,” Brooks asserted. “The center of the community is exactly where Sen. Hagel is on issues relating to Israel,” Williams claimed, according to Politico. “He’s certainly very knowledgeable about our defense and our intelligence establishment. He has, without doubt, the personal skills that are important for a Cabinet officer,” Hamilton told Politico. Soon after taking office, Obama named Hagel to an intelligence oversight board, which he still co-chairs with former Sen. David Boren (D-Okla.). At that time, a top figure in Jewish Democratic circles voiced his opposition to a Hagel taking a more significant role. “If [Hagel] was taking a policy role, we’d have real concerns,” Ira Forman, then the executive director of the National Jewish Democratic Council, told The Weekly Standard in 2009. Obama is also considering Deputy Secretary of Defense Ash Carter and former Undersecretary of Defense Michele Flournoy for the top defense post, according to administration officials.